Following are further product and service announcements made at the American Society of Human Genetics 2017 Annual Meeting, held Oct. 17-21 in Orlando, FL. CombiMatrix presented new data at ASHG from a large-scale, first-of-its kind study showing that genomic alterations decrease in frequency and severity from conception through development into childhood. The study—which analyzed nearly 32,000 samples—was intended to provide a comprehensive assessment of chromosomal imbalances and their adverse impact upon human growth and development from conception to childhood. Investigators explored and catalogued the frequency, severity and complex evolution of genomic abnormalities with adverse effects on human conception, pregnancy and childhood growth and development. The researchers obtained data from CombiMatrix's exclusive data collected over a multi-year period. An abstract of the study, “Large-scale cytogenomic analysis of samples from conception to childhood: a comprehensive assessment of the landscape of unbalanced genomic abnormalities,” is available at http://combimatrix.com/providers/educational-references. The abstract reviewed outcomes from preimplantation genetic screening (PGS) of 6,883 embryos and chromosomal microarray analysis testing of 12,324 pregnancy loss samples, 4,176 prenatal samples, 1,564 neonatal samples and 7,047 pediatric samples. Embryo or early pregnancy loss samples showed the highest abnormality rates and a predictable correlation between the severity of chromosomal abnormalities, primarily aneuploidies, with unsuccessful implantation or progression to viable pregnancy. Prenatal and neonatal samples showed that the frequency of significant genomic alterations correlated with the incidence of significant physical and developmental abnormalities, but were not necessarily incompatible with life. Pediatric samples were predominantly deletions and duplications rather than aneuploidy and had less drastic adverse effects. “This is the first study to provide a comprehensive overview of the nature and frequency of cytogenomic abnormalities with adverse effects from the earliest post-conception developmental stages (i.e., embryos) through pregnancy and into childhood,” stated Trilochan Sahoo, M.D., FACMG, CombiMatrix VP of clinical affairs and director of cytogenetics. Beijing GrandOmics said it intends to develop novel assays for genetic diseases in China using Bionano Genomics’ Saphyr System for genome mapping, through a collaboration whose value was not disclosed. Beijing-based GrandOmics positions itself as China's first third-generation sequencing service provider and the first third-generation sequencing based precision medicine company. GrandOmics began building its capacity for generating Bionano data earlier this year when it acquired its first Saphyr, in addition to its six PacBio Sequel and six Oxford Nanopore GridION platforms. One of Bionano’s first indications for the Saphyr platform has been the neuromuscular disease facioscapulohumeral muscular dystrophy (FSHD). FSHD is tied to variation in the size of the D4Z4 arrays, in which a 3.3 kbp unit on chromosomes 4 and 10 is repeated multiple times, but only permissive alleles with low copy numbers in chromosome 4 are pathogenic. While Southern blot is used to characterize array sizes above and below a threshold level and to identify permissive alleles today, more precise information such as the specific number of D4Z4 repeats and the mosaic level of variation hold diagnostic value that according to GrandOmics is not captured by current methods, including second or third generation sequencing technologies. 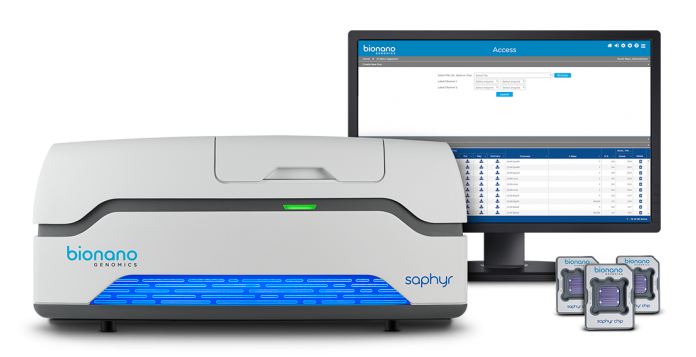 Saphyr is Bionano’s third-generation optical mapping solution, designed to enable visualization of whole genomes with long-range reads from 100,000 bp to megabase pair lengths. Bionano is at Booth #555 at ASHG. Phosphorus, a computational genomics company, has launched its Elements software suite, a software-as-a-solution (SaaS) platform designed to power diagnostic genetic testing for laboratories, hospital networks, and other healthcare users. The Elements platform consists of six distinct modules—one each for managing logistics, accessioning, lab tracking, bioinformatics, variant curation, and reporting. The suite is part of Phosphorus’ broader in-house testing partnership, which includes predesigned sequencing assays, reimbursement consulting, and operational assistance. According to Phosphorus, Elements features full HIPAA compliance, scalability, security, intuitive dashboards, and highly customizable algorithms, forms, and workflows. Elements is also designed to be integrated easily with existing workplace systems, such as legacy variant data annotations, EMR systems, and more. Elements also includes customer service for users seeking guidance on SOPs, billing assistance and more. In addition to the software suite, New York-based Phosphorus also markets a catalogue of compatible specialty diagnostic genetic tests. The tests offer what Phosphorus says are expert-curated panels, powerful data analytics, a simple testing workflow, and rigorous variant interpretations to ensure the most accurate results for patients. “Our portfolio of diagnostic products, paired with Phosphorus Elements software, is the first end-to-end solution enabling laboratories and medical centers to easily build and expand their precision medicine capabilities,” Bisignano added. Phosphorus is at Booth #1005 at ASHG. LifeOmic said it will streamline clinical interpretation of its genome sequencing data using Genomenon’s Mastermind Genomic Search Engine, through a partnership whose value was not disclosed. LifeOmic plans to automate prioritization of its genome sequencing data for clinical patients by annotating disease-causing variants with citations from relevant biomedical literature. Mastermind is designed to link data on DNA mutations from patients with citations from scientific publications, with the goal of understanding the clinical impact of each mutation. Mastermind aims to comprehensively identify all clinically relevant and prioritized articles, and to date has indexed more than 5.5 million scientific articles covering every disease, gene and variant. By providing immediate insight into published scientific literature, LifeOmic said, Genomenon’s Mastermind search engine accelerates the variant interpretation process by helping pathologists and geneticists decide which variants are likely associated with disease and important for clinical care, and which are likely benign and can be safely ignored. LifeOmic has built the LifeOmic Precision Medicine Platform™, an analytic platform with advanced informatics designed to process and analyze a patient's whole genome. The platform has been designed as a secure cloud service for the long-term storage, retrieval, analysis and clinical use of genomic and other medical information. The companies sponsored a presentation at ASHG.